Cab: Check the overall condition. Are all the switches and gauges in proper working order? Note any broken glass, torn seats, or worn floor mats. Engine: Engine inspection includes checking all vital fluids, drive belts and electrical systems. Be watchful for oil leaks and remember to check underneath the engine as well. Also check the radiator and inspect the coolant if the engine is cold. Under the Body: Raise the body and check the powertrain and frame rails. 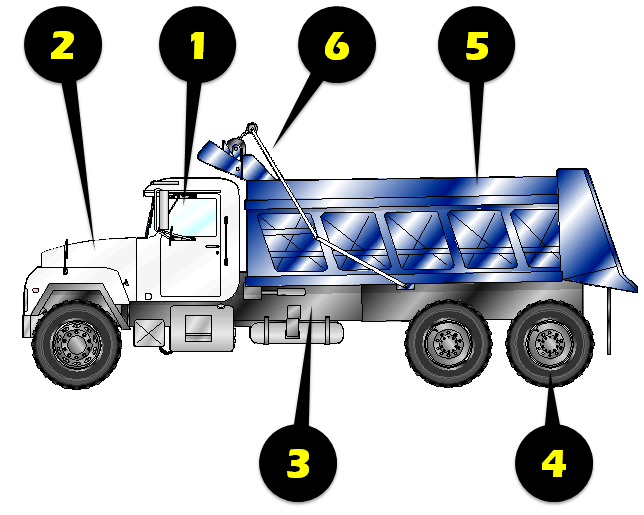 Also check the lift cylinder for leaks and damage and inspect the bottom of the dump body for stresses or damaged support structures. Tires: Note the age and general conditions of all the truck’s tires. Also look for uneven wear patterns, which can tip you off to potential front and rear suspension problems. 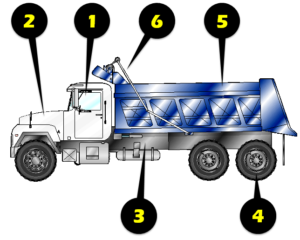 Body: Body inspection includes a visual search for metal fatigue and cracks, as well as a tailgate and locking pin assessment. Also make sure the body floor is smooth and that the lift hinge assembly is tight. Tarp: Check tarp and tarp rack for condition and operation. Tip: Consider a truck history report from www.RigDig.com to spot title issues as well as history of accidents and inspections.